I want to wrap up LunaCafe’s February 2009 Love Rules! 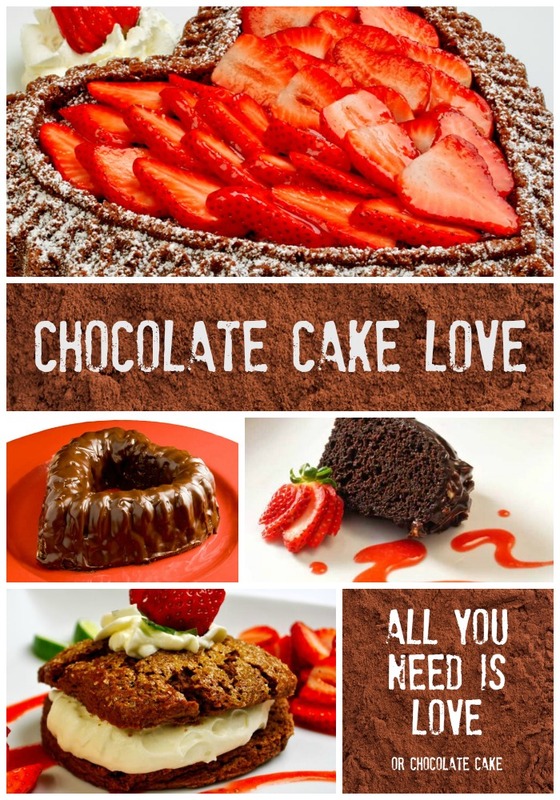 All Chocolate! All Month! celebration with a really special dessert. If you’ve been following along, you know that I’ve been covered in cocoa powder and melted chocolate all month. I discovered and perfected the world’s most delectable cookie, Bittersweet Chocolate & Toasted Walnut Cookies Perfecta Mundo, created Bittersweet Chocolate & Montmorency Cherry Morning Love Muffins, Mexican Hearts of Fire Cookies, Luscious White Chocolate & Raspberry Rose Petal Cheesecake, and Bittersweet Chocolate and Cabernet Butter Cake, and posted Northwest Chocolate Desserts 2008, a roundup of 19 chocolate desserts from some of the best pastry chefs in Portland and Seattle. It’s hard to top all of these. So I asked myself what really important chocolate flavor pairing I didn’t explore for this year’s celebration. Caramel and bittersweet chocolate came immediately to mind, followed by fresh rosemary and bittersweet chocolate. Then I asked myself what as yet unsung key dessert techniques deserved their moment in the chocolate limelight. 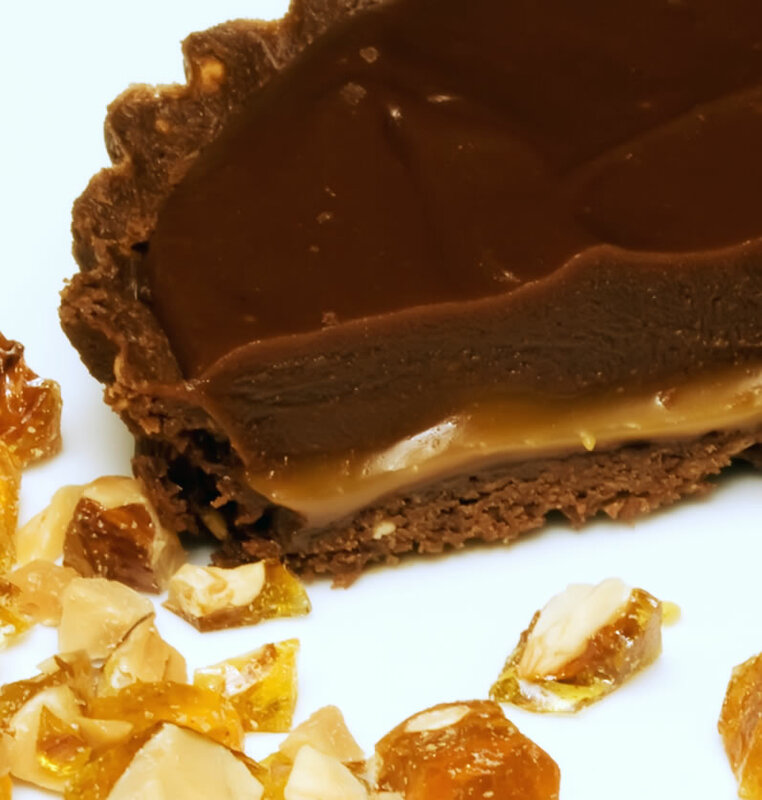 Short-crust pastry, caramel sauce, praline, and ganache all tumbled out on the stage of my mind and took a bow. And that’s how these lovely little tarts came to be. Well, that bit of brainstorming and a fortuitous inspiration that occurred while I was admiring a freshly made batch of Burnt Sugar Sauce and Bittersweet Chocolate Ganache. What would happen if I combined them? You will discover that in the recipe below. I first encountered the intriguing flavor combination of chocolate and fresh rosemary at Sahagun Chocolates in Portland, Oregon. It was LOVE at first bite. I couldn’t wait to start trying the combination out in desserts. This is the first and it’s sensational. There is a fair amount of work involved in making these delicious tarts, but all of it can be done in advance. The tarts keep perfectly, covered in the refrigerator, for 2-3 days. Prepare each of the key components above. 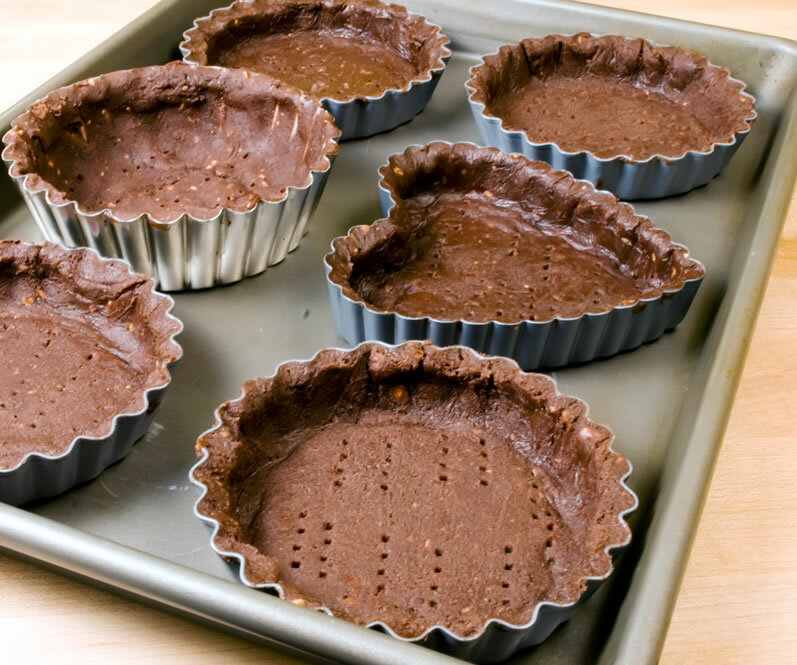 Dollop 1 tablespoon of the room temperature Burnt Sugar Sauce onto the bottom of each of the six, 4-inch tart shells. Tip and rotate the shells to cover the bottoms with the sauce. Refrigerate for 30-45 minutes to set the caramel. Measure the remaining Burnt Sugar Sauce and add to a medium mixing bowl. Measure the same amount of Bittersweet Chocolate Rosemary Ganache and gently stir it into the Burnt Sugar Sauce. (You may have a little ganache remaining, which can be used for another purpose. The important thing here is to combine equal amounts of both the sauce and the ganache.) You now have Bittersweet Chocolate, Burnt Sugar & Rosemary Ganache. 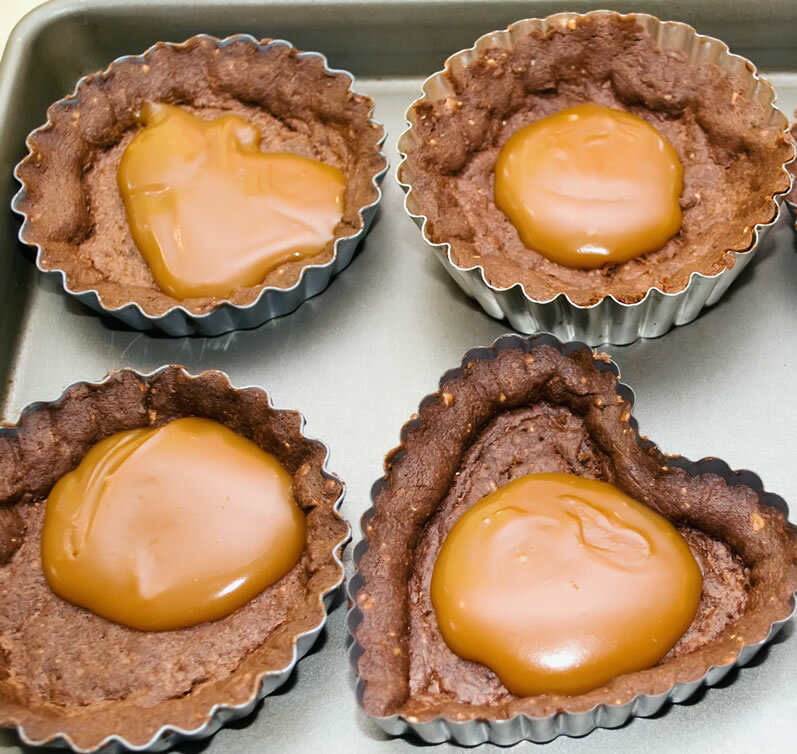 Spoon 2-3 tablespoons of the ganache over the caramel in each pastry shell. Level with a small offset spatula. Refrigerate until ready to serve, covering lightly with foil after the ganache is set. Remove from the refrigerator 30 minutes before serving to let the ganache and caramel come to cool room temperature. If desired, serve with Almond Praline, whipped cream or vanilla bean ice cream, and small sprigs of fresh rosemary. This tender, crisp, delicious pastry falls in the category of French dessert pastry called Rich, Sweet, Short Crust Pastry. There is a high proportion of butter to flour and egg yolk is added as the liquid, rather than water. Because there is so much fat and so little liquid in this dough, it is sticky and a little difficult with which to work. However, as compensation, it can be rerolled almost endlessly without toughening. The baked pastry is almost a cookie. Sift the flour and cocoa together into a small bowl. Stir in the toasted, ground almonds. Reserve. 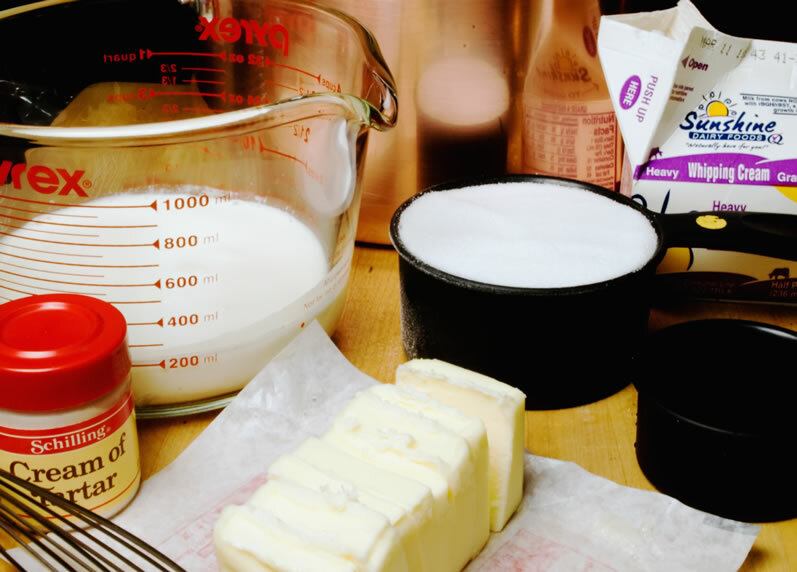 In the bowl of a stand mixer fitted with the paddle attachment, cream the butter and sugar until light in color. Add the egg yolk and mix until well incorporated and light in color. Add all but 2 tablespoons of the flour mixture, and pulse the machine to incorporate. If the dough is too moist, add some or all of the remaining 2 tablespoons of flour mixture, and pulse briefly to incorporate. Remove the dough from the bowl, shape quickly into a log, cut into 6 equal weight pieces, roll each of these into a ball, flatten each ball between sheets of plastic wrap, seal, and refrigerate for at least two hours. Roll out each piece of dough between two sheets of plastic wrap to a 5-inch diameter. Carefully peel the top layer of plastic wrap from the dough and position the dough in a 4-inch, nonstick, shallow, removable bottom tart pan, plastic wrap side up. Press the dough gently into the bottom corners and against the sides of the tart pan. Push the top edge in a bit to make a thicker edge and then press down against the top edge to cut off the excess dough. Carefully remove the plastic wrap and pull away the excess dough. (Excess dough can be chilled and rerolled.) Repeat for the remaining tart shells. Set the tart pans on a baking sheet and refrigerate for at least 30 minutes to relax the gluten and set the butter. Bake at 400° for about 12 minutes, until the air is fragrant with chocolate and the pastry crusts appear dry and set on top. Remove from the oven and let cool on a wire rack. After cooling completely, store in an airtight container, or wrapped in foil, in a cool dry location for up to 3 days. Makes six, shallow, 4-inch diameter, pastry shells. Oh, how I love this sauce. There just can’t be a better taste and texture experience in the world than caramel. This caramel is taken to just beyond the amber stage so that it has a deep, burnt sugar aspect. 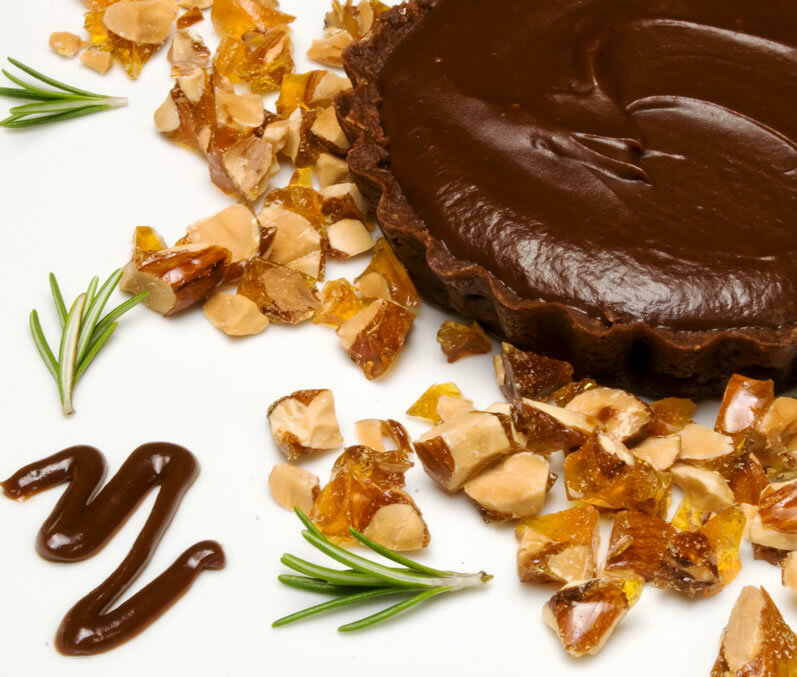 Burnt Sugar Caramel Sauce can be served warm over ice cream, as an accompaniment to other desserts, or as in this recipe, spooned onto the base of a pastry shell, which is then covered with a ganache or stirred custard. In a 4-cup glass measuring cup or bowl, add the cream and butter and microwave for about 1 minute, just until the butter melts. You may need to briefly whisk the mixture to incorporate and melt the butter. Reserve. In a medium saucepan, over medium-low heat, combine sugar, cream of tartar and water. 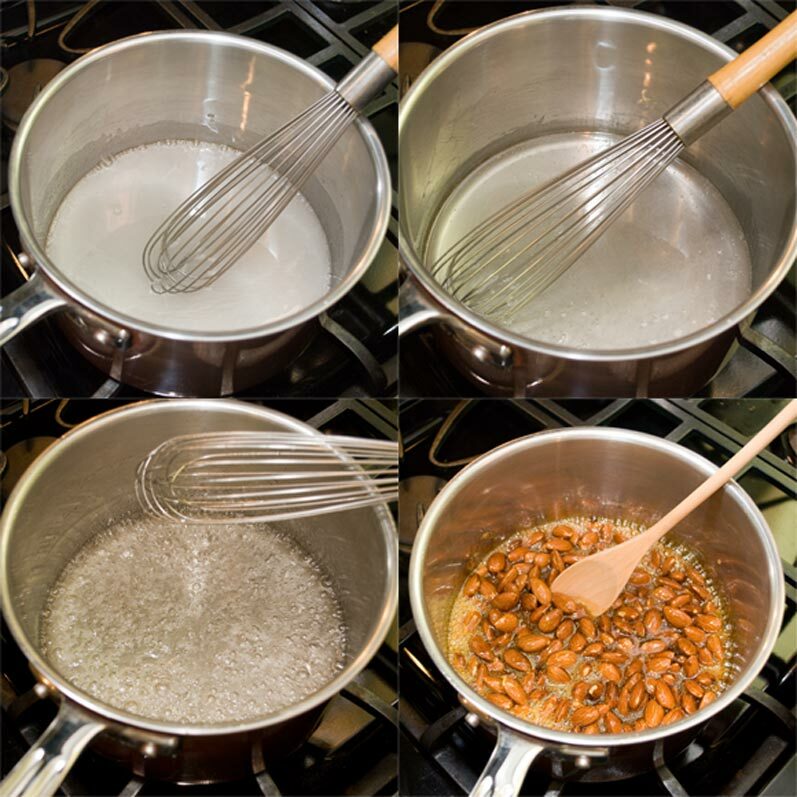 Whisk constantly until the sugar dissolves and the syrup clears.NOTE To prevent crystallization, do not rush this step; use a pastry brush dipped in cold water to repeatedly wash down any sugar crystals from the sides of the saucepan. If the syrup comes to a boil before it has cleared, remove from the heat, and keep whisking until it clears. When the sugar is fully dissolved, raise the heat, bring the syrup to a boil, and stop whisking. Continue heating without stirring until the syrup turns a dark amber color. Don’t go too dark, of course, or the sauce will taste bitter. Remove from the heat and immediately and carefully (stand back and use a long handled whisk) pour in the hot cream mixture. The mixture will sputter and foam up, but the pan should be large enough to contain it. Continue whisking to incorporate the cream mixture and to dissolve any hard bits of caramel. Whisk in the salt and vanilla. Pour into a bowl (strain if you think it necessary) and let cool to room temperature. 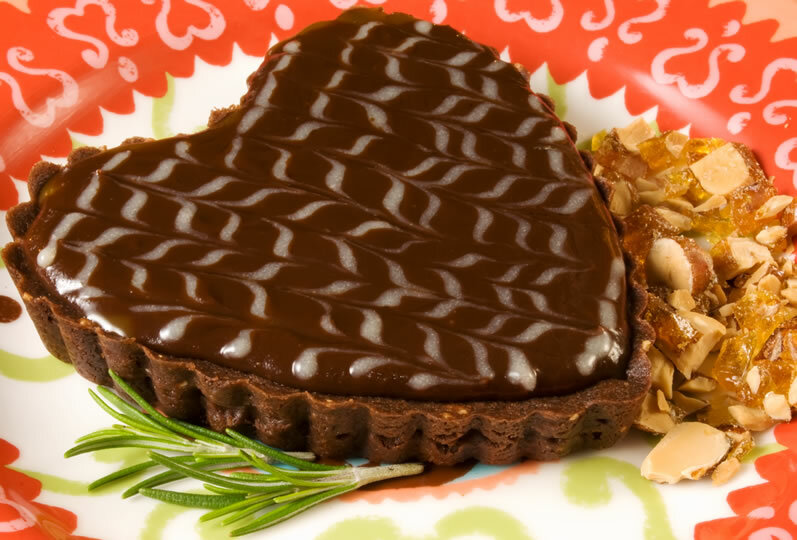 This bittersweet ganache is not for the faint of chocolate heart. However, we are going to combine this with Burnt Sugar Sauce, thus giving it some added sweetness. In a small saucepan, bring the cream, corn syrup and rosemary just to a simmer. Remove from the heat and let steep for at least 1 hour. 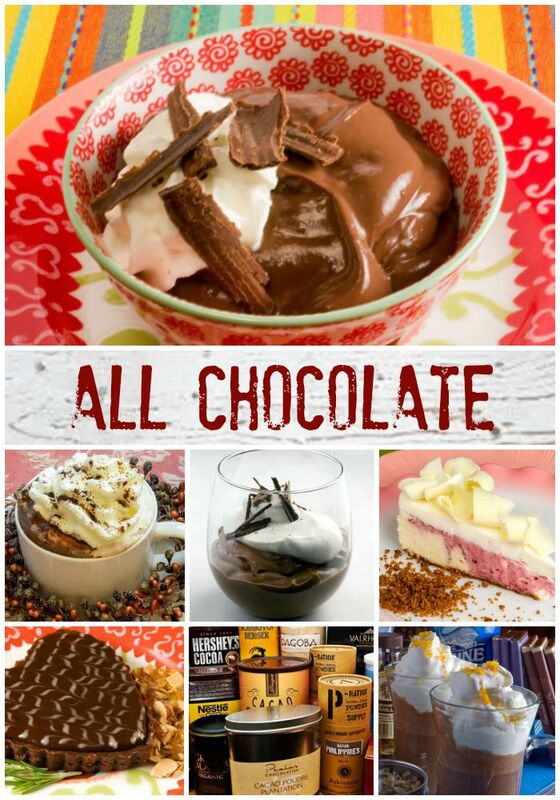 Put the chocolate in a glass mixing bowl and reserve. After the rosemary has steeped for at least an hour, bring the cream mixture back to a simmer and then immediately strain it over the chocolate. Whisk the chocolate mixture slowly until the chocolate is completely melted. When the chocolate mixture registers 95° on an instant read thermometer, stir in the butter. Let the ganache cool to room temperature. Praline is a delicious caramel and nut powder that is often used in desserts. Store the powder in an airtight container; it will keep for months. NOTE To prevent crystallization, do not rush Step 1; use a pastry brush dipped in cold water to repeatedly wash down any sugar crystals from the sides of the saucepan. If the syrup comes to a boil before it has cleared, remove from the heat, and keep whisking until it clears. 1 cup toasted almonds, roughly chopped. In a medium saucepan, over medium-low heat, combine sugar, cream of tartar and water. Whisk constantly until the sugar dissolves and the syrup clears. When the sugar is fully dissolved, raise the heat, bring the syrup to a boil, and stop stirring. Continue heating without stirring until the syrup turns a dark amber color. An instant-read thermometer will test at 340°. 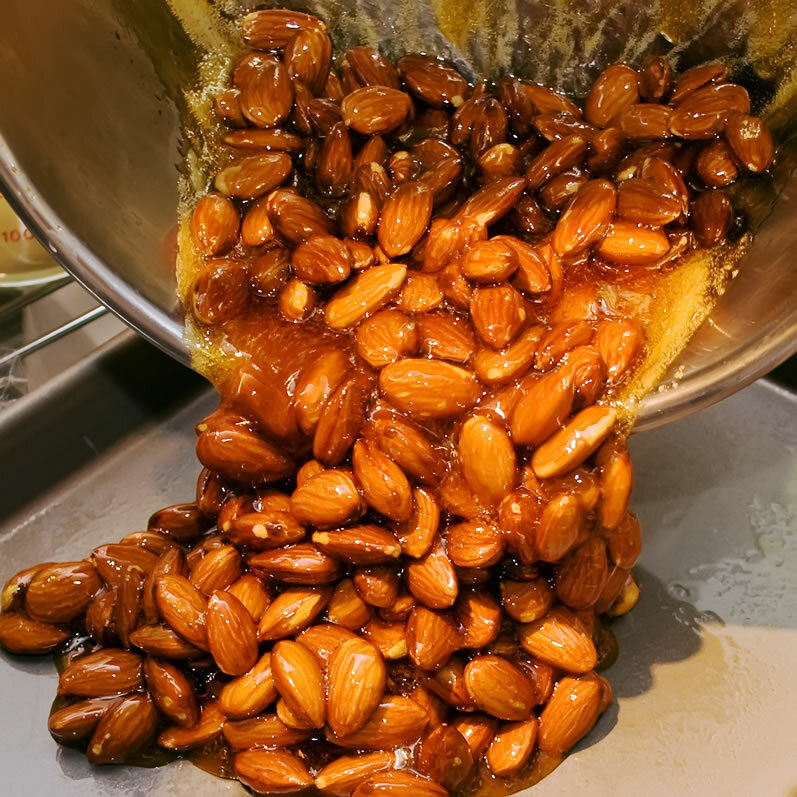 Add the almonds and stir gently. Pour this mixture onto a buttered baking sheet and let cool completely. When hard and cool, break the praline up into pieces and either roughly chop or pulverize in a food processor. Store at room temperature in a Ziploc freezer bag. Intrepid cook, food writer, culinary instructor, creator of the LunaCafe blog, author of Pacific Northwest Palate: Four Seasons of Great Cooking, and former director of the Northwest Culinary Academy. “5. When the chocolate mixture registers 95° on an instant read thermometer, stir in the butter”. This is the first time you mention butter in this portion of the recipe … how much butter for this chocolate layer? I’m thinking of adding 1/4 c.
Oh, there you go again! 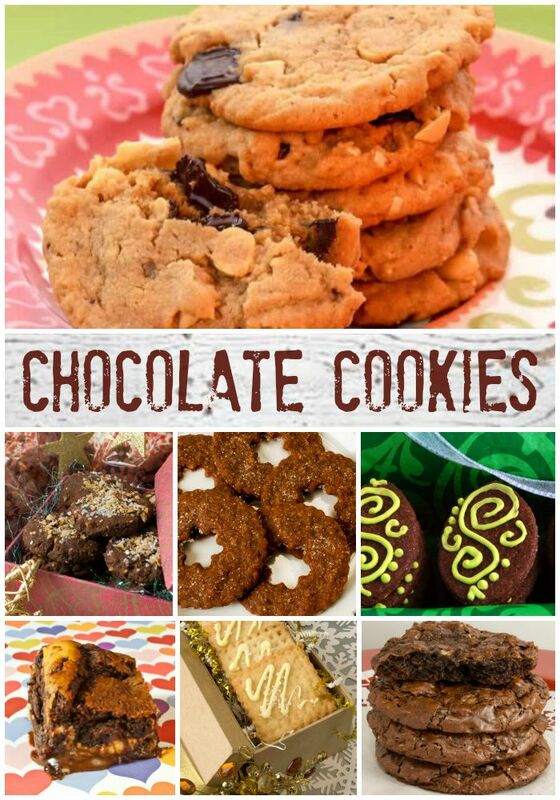 You are the Goddess of Chocolate, hands down! I gain weight just by looking at your gorgeous photos. How much did you gain this last month? Or maybe it was the significant other that spared you. 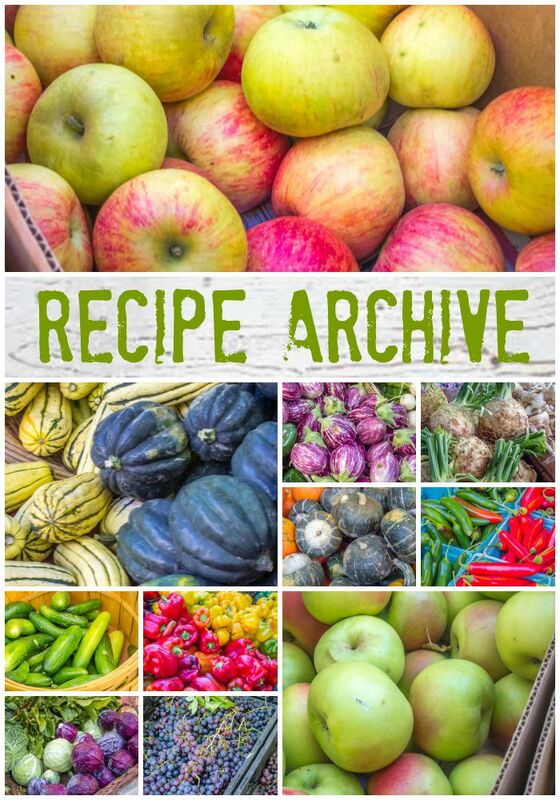 One thing is for sure, if I want an amazing recipe, I come here.